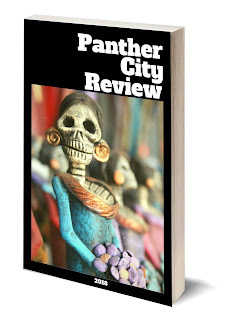 Panther City Review is an annually published literary journal by Sleeping Panther Press, based out of Fort Worth, Texas. In this third issue, writers from Texas and beyond share their works reflecting on the theme of wisdom. Paul Bodley- Paul Bodley has made his living in corporate America, but has maintained a passion for writing. The poem Walkin' Blues he wrote as a seventeen-year-old, and updated it to mirror society today. Rachel Crawford- Rachel Crawford’s poems and short stories have appeared in Red Rock Review, Mudlark, Lucid Rhythms, The Lyric, Figures of Speech, Apeiron Review, Red River Review, The Yellow Chair Review, Illya's Honey, Freshwater Poetry Journal, Adanna Literary Journal, Third Wednesday, r.cv.r.y., Literary Juice, The Wayfarer: A Journal of Contemplative Literature, Anima Poetry Journal, Crack the Spine, Rock & Sling: A Journal of Witness, Shot Glass Journal, and RiverSedge. Her poems "The Limitations of Theory" and "Mater Primigenia" each received a Poetry in the Arts Award through Baylor University, and her short story "First Names" received the 2016 short story award from the National Federation of Press Women. She's a contributing co-editor of the anthology Her Texas (Wings Press, 2015), and she is at work as co-editor of the anthology A Fire to Light Our Tongues. She is currently a doctoral student in Arts and Humanities at The University of Texas at Dallas. Heath Dollar- Heath Dollar is the author of Waylon County: Texas Stories (Sleeping Panther Press, 2017). His writing has appeared in the Dallas Morning News, among other publications, and he was a finalist for the Jory Sherman Short Story Award, with his work also being recognized by American Short Fiction and the Texas Observer. Dollar has lived in both Europe and Asia, and his work as the lyricist and frontman for a blues-rock band was released on a Prague record label. You can find him online at heathdollar.blogspot.com. Lynda Effertz- Lynda is a 74 year-old psychotherapist who loves to sculpt and paint. She writes occasionally when doing a presentation, but this is her time submitting anything for publication. Vanessa G. Foster- Vanessa has considered herself a writer since the tender age of nine when she felt compelled to hide in trees with a notebook or scrap of paper and write her thoughts and "make up poems". She no longer hides in trees, now using Notes on her iPhone to write down her thoughts and ideas, but is still a loner and can generally be found sitting at her favorite restaurant by herself gently "listening" to nearby conversations, gathering ideas for her blog, Unguarded Moments. Beware the single diner at a nearby table next time you dine out. You can read more by Vanessa at https://vgfoster.com. Robin Goodpaster- Robin writes mystery and science fiction stories and poetry. She has been scribbling in notebooks for a long time and has recently ventured into publishing her work. Her goal to visit every national park in the U.S. She lives in Dallas, Texas, with her husband, son and dog. You can follow her on Instagram at @robinthewriter or her website at behance.net/robingoodpaster. Patrick Harris- Patrick lives in Fort Worth, TX, travels to see Pearl Jam in concert, and can teach people about whiskey. D.H. Jonathan- In addition to writing, D.H. Jonathan, the author of the 2016 novel The "Volunteer," has been modeling for artists and art classes for over 30 years, won $32,000 on the hit ABC gameshow Who Wants to Be a Millionaire in 2001, and currently lives in Fort Worth, TX. You may follow D.H. Jonathan at http://dhjonathan.com. Gary T. McDonald- A native Texan, Gary T. McDonald is a practicing Buddhist and an award-winning playwright and filmmaker with a life-long interest in the origins of Christianity. His latest film is The Fourth Noble Truth (winner of the Audience Award at the Sonoma International Film Festival). The Gospel of Thomas (the Younger) is his first novel and is the basis for his forthcoming historical epic The Blood of Men and Angels. He has also completed a novella, "Blood" Money about the fictional discoverer of The Gospel of Thomas (the Younger). You can find more about Gary online at https://www.garytmcdonald.com/. Zee Mink-Fuller- I write from a barn loft which gives me the solitude I need to quiet the everyday noise. I love to travel...opening up my imagination to unfamiliar territory gives me peace. I have been previously published numerous times, which is nice and I hope to pursue publishing more aggressively. My writing, whether published or not, is my therapy. Mark A. Nobles- Mark A. Nobles is a Fort Worth based writer and filmmaker. His work has appeared in Panther City Review, Crimson Streets, Cleaver Magazine, and other publications. He has produced and/or directed three feature documentaries and several short, experimental films. He can be found on Facebook @ Flyin Shoes Films. Ken Pardue- Ken Pardue is an essayist, short story writer, and poet living in Fort Worth, Texas. He has had poems published in a number of venues, including The Texas Observer, California Quarterly, Borderlands, Barbaric Yawp, and two anthologies of Texas poetry. Also, stories of his have been published in Lynx Eye, Hardboiled, and the on-line literary journals Scrivener's Pen, SouthLit.com, Verdad.com, Amarillo Bay, and The Write Room. In 2013, he was one of four finalists for the Texas Observer Short Story Contest. Finally, his essays have appeared in The Texas Observer, The San Antonio Express-News, The Fort Worth Star-Telegram, Still Crazy, and The Fort Worth Weekly. You can read more by Ken Pardue on his blog at http://kwheatcroft.blogspot.com/. Virginia Parrish- Virginia Parrish is a former teacher and current writer. She is a transplant to Fort Worth from Philadelphia. Virginia currently has the first in a series of mysteries listed on Amazon Kindle, titled FatalityFile: A Dan Brennan of Anchor Property & Casualty Insurance Book. Rachel Pilcher- Rachel Pilcher, writer, founder of Rachel Pilcher Writing Workshops and publisher at Sleeping Panther Press, holds Bachelor of Arts in English and History from Texas Wesleyan University and a Master of Library Science from Texas Woman’s University. Rachel worked for several years in Editorial and Development for Harcourt College Publishers, but a layoff she transferred her focus to teaching and librarianship. Rachel has a wide range of published work in Aries, the Lone Star Film Festival Film Review, Panther City Review, and the Fort Worth Weekly, as well as a short book for teachers, titled Classroom Management for the Real World. You can read more about and by Rachel Pilcher at www.rachelpilcher.com. Donna Walker-Nixon- Donna Walker-Nixon served as a full professor at the University of Mary Hardin-Baylor, where she received the distinction of receiving the Mary Stevens Piper award for excellence in teaching. She currently serves as an adjunct lecturer at Baylor. While at Mary Hardin-Baylor, she founded Windhover: A Journal of Christian Literature in 1997. She co-edited the Her Texas series with her friend and mentor James Ward Lee, and she co-founded The Langdon Review of the Arts in Texas. In 2010, her novel Canaan's Oothoon was published. As lead editor of the anthology Her Texas: Story, Image, Poem & Song, she has discovered that the voices of women writers and artists truly mean something to both men and women. Jenn Zatopek- Jenn Zatopek is a licensed professional counselor as well as an aspiring writer. Her work has been featured in Panther City Review. She lives in Fort Worth. Visit her webiste at www.theholyabsurd.com. Copyright 2018 Panther City Review. Simple theme. Powered by Blogger.